Make Light Work of Heavy Tables! Ready to roll with the table mover! 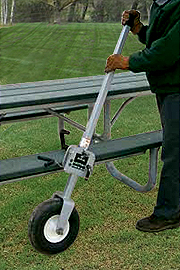 This commercial tool is just right for parks and campgrounds that have to occasionally move tables. 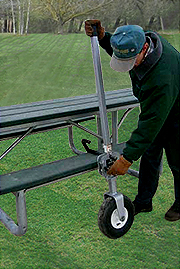 Once The Table Mover is centered on the table minimal lifting is required giving the operator excellent control and reduces any chance or injury. 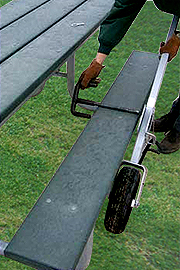 The Table Mover will move most popular style picnic tables that are up to 12 ft. long and with it's two 12" diameter wheels, it makes small work of uneven ground and carries the table weight (up to 500 lbs). 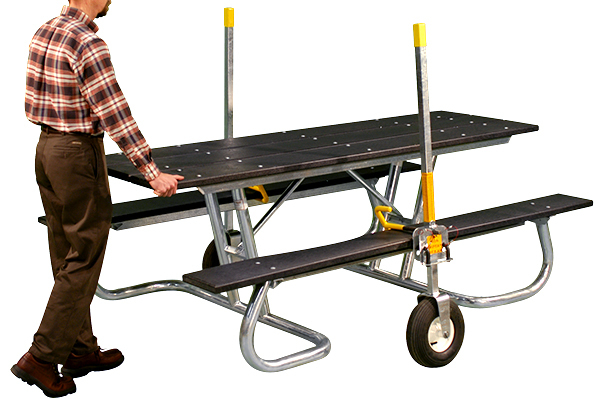 The perfect tool for moving heavy picnic tables with just one person! It attaches to the seat planks and is designed to fit most styles and thickness. It fits wood, aluminum, plastic or vinyl coated steel tables with 2"x 10" or 3"x 10" plank seats.